I was “introduced” to Bob McMillan through his guest post on the MovNat website awhile back. I was so excited as I read his story, and watched his video, that I sent him an email to thank him for sharing. I also commended him on not only staying active in his early 70’s; but, also encouraging other seniors to get outdoors and play. What I didn’t know was that Bob lives right here in Northern Virginia! He was kind enough to do an email interview with me, and I look forward to meeting him in person very soon! Bob McMillan is the founder of The Come Alive Project. Bob has been an evangelist for senior fitness since the early 1990s. Bob believes that with the Baby Boomers coming of age, the time is now for a real advocate for senior fitness to establish the kind of programs offered by The Come Alive Project. The Come Alive Project is a no-nonsense site for seniors over 60 who want to look better, feel better, and come alive for the rest of their lives. 1) Tell us your personal story. How did you become interested in helping seniors “Come Alive”? About 10 years ago I proposed a senior fitness concept to Patrick Avon of the Sergeant’s Program, one of the nation’s first “boot camp” style fitness programs. I had been an exercise nut all my life and as I got older, I felt “seniors” were not being served well by the fitness community. Patrick Avon and I worked together for a year; but, the program was eventually cancelled. Then I formed Act 2 Fitness for people over 55. It never really took off. I returned to my previous life for a few years and then retired. I decided to take my fitness knowledge back to the marketplace and create a new program for seniors, The Come Alive Project. 2) How did you initially hear about MovNat? I read an article in Men’s Health Magazine several years ago. Then I went to the website and saw the video, The Workout That Time Forgot. I said to myself, “I have to do this.” Later I saw that the first U.S. workshops would be held in West Virginia, only about a six hour drive for me, so I signed up. 3) What did your friends and family think when you told them you were going to the 5 Day training? My wife thought I was crazy and that I was too old to play a young person’s game. Also, I was retired and we were living on a fixed income, so the cost was a consideration. 4) What were your concerns/reservations going into the 5 Day course? Believe it or not, my concern was not that I was too old (age 69 at the time) to do the program; but, that my age might hold back some of the other participants. Erwan LeCorre stressed how the program was scaled to handle all shapes, sizes, and ages. He assured me that I would not hold anyone back. He was right. 5) What was your experience? Were those concerns valid? The concerns were probably valid in my mind at the time. But Erwan was true to his word that I would be able to handle it. Actually, I was able to do nearly everything that the others did, just more carefully. Erwan made safety one of his major concerns and watched over me carefully when it came time to leap from boulder to boulder at the river. Sleeping in the tent and eating paleo added significantly to the experience. It was work; but, it was FUN! We had a great team and if I, or anyone else ever showed signs of slowing, the rest encouraged us onward. 6) How was the teaching scaled for each participant? Actually, there was very little scaling required. Most the moves lent themselves well to anyone. I was able to lift the same trees and rocks as the others. I couldn’t throw the rocks as far, nor could I jump as high or run as fast as the younger folks; but, that didn’t affect the quality of the movements. As I mentioned above, Erwan made sure everything I did was safe. 7) How has MovNat changed your training/approach to life/health? Good question. I have learned to stay away from exercise machines in the gym (yes, I do go to the gym most days). I am fortunate to have a park nearby that has a PAR course (exercise stations outdoors), as well as lots of woods and fields. I shot the video that was on the MovNat website there. I emphasize natural mobility, flexibility, and strength as a combination far more than the average person at my gym. I sometimes get odd looks from people who wonder what I am doing/are amazed at what I am doing. 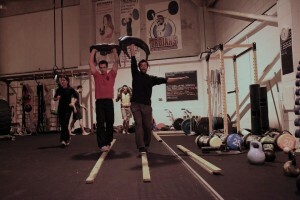 But the MovNat training taught me that movements that may look difficult can be quite simple with bodyweight transfer, bodyweight shifting, and the proper use of gravity and momentum. This is what I want to get across to seniors. Most seniors don’t have any knowledge of Paleo or natural movement concepts; although, when I mentioned Paleo at a recent workshop, a couple of active and vibrant 80 year olds were at least familiar with the term. I stress natural mobility and flexibility as the goal. 9) Have you been successful in getting other seniors interested in the benefits of dietary changes and outdoor play? What is the biggest obstacle in convincing seniors to break out of their comfort zone? Dare I say this? Most seniors are stubborn and set in their ways. It’s not that they have closed minds, it’s simply that most think of exercise as either a “painful” experience or a social hour at a group exercise class. 10)What would you say to a senior who tells you that they want to work out on a stationary bike or machines because they are “safe”? First let me suggest that even if they are just riding an exercise bike, they are at least doing something they will benefit from. The benefit depends on how often, how long, and how intense the workout is. They need to do something for overall strength, flexibility and mobility other than just the cardio and leg strength they get from riding. As for machines, the gym I go to is filled with them and I rarely use any of them. This gym has a large population of active seniors and most stick with dumbells and exercise bands. In my opinion, the two best exercise machines ever created are the human body and the floor. Of course if you’re outside, nature provides its own gym and humans were built primarily to function in the outdoors. I can show a senior how to develop more strength and natural movement by using their own body and the floor than by using any machine ever built. 11)Tell us about The Come Alive Project. What is the mission, what are your goals, how can we help you spread the word to other seniors? I created The Come Alive Project to inspire, motivate, educate, and instruct active seniors over 60 to build and maintain a high personal energy level through natural movement (exercise), eating properly, and through a Come Alive Attitude. That’s a long sentence but it’s filled with meaning. Personally, at age 72, I would like to become a strong, national voice in spreading the doctrine of senior fitness, as demonstrated by my “being what I talk about”. You and your readers can help me spread the word by directing people to my website at www.thecomealiveproject.com and encourage them to subscribe to the free publication, Energy Bites™. In addition, I’ll be releasing an Energy Bites™ CD in April or May, and am developing a useful and Useable Exercise Manual and DVD for seniors, to be released in July and August. 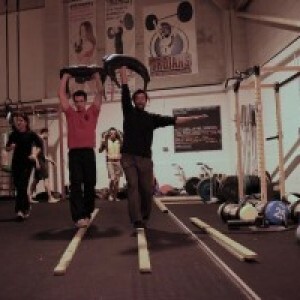 Read Bob’s guest post on the MovNat website, and watch his video demonstration of his moves!